Early Saturday morning I called Bob to see if he wanted to go for a walk like we did last week. "It's 11 degrees outside," he said. Oh, yeah. Maybe not. After a few hours, it warmed up to a balmy 20-something so I put on my walking shoes and walked down to the Spice House to get some coriander and cumin seeds. As usual, I came away with so much more . . . According to Herbs & Spices: The Cooks Reference, Sumac is the fruit of a decorative shrub that grows wild on sparsely wooded uplands around the Mediterranean, especially Sicily. Indigenous to Iran, it also grows elsewhere in the Middle East, most notably Turkey. 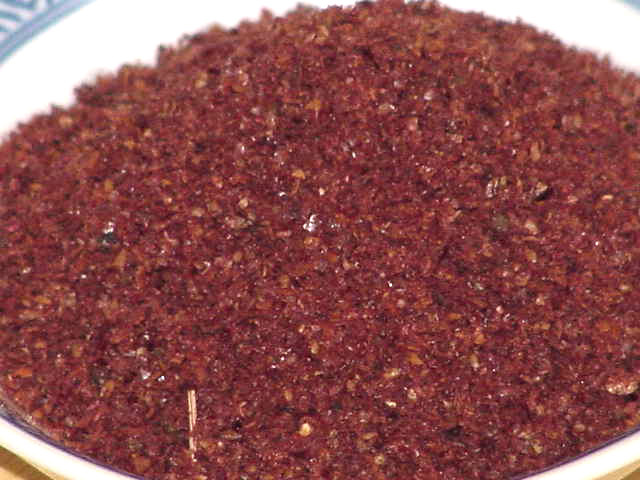 Ground sumac is sprinkled liberally over rice and mixed with freshly-cut onions as an appetizer. It is also used in the Turkish specialty doner kabob and it's an ingredient in one of my favorite dishes, fattoush salad. Sumac is an essential part of za'atar, a blend of sesame seeds, thyme and sumac which is used in marinades, rubs, and dips. Expect to hear more about this later, as I plan to make it pretty soon. Mixed as a paste with olive oil, it can also be spread over bread or mixed directly into the dough before baking. Sumac is used primarily as an acidulant, much like we in the western world use lemons and Asia uses tamarind. It does not have much of its own taste, but brings out the flavors of the foods to which it is added, much like salt. In powder form, it is rubbed onto food before cooking - fish, kebabs, and vegetables. In most Middle Eastern houses bowls of sumac and chili flakes sit on the table, much like our salt and pepper. Sumac is good with chicken, chickpeas, eggplant, fish and seafood, lamb, lentils, raw onion, pine nuts, walnuts and yogurt. It combines well with allspice, chili, coriander, cumin, garlic, mint, paprika, parsley, pomegranate, sesame, and thyme. The berries vary in color from brick red to red-brown or maroon, depending on from where they are grown. The sumac above actually has more red in it than the picture shows. For more information on this intriguing spice, check out my favorite online spice reference, Gernot Katzer's spice pages.